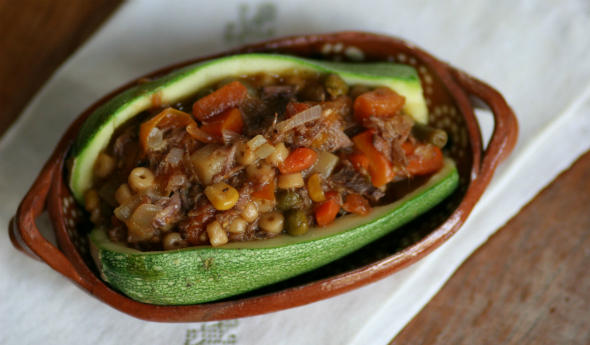 Tender, sweet calabacita squash, also known as tatuma squash, are filling and hearty when stuffed with a traditional beef and vegetable guisado. This light recipe works especially well for busy office folks who need a take-along lunch that reheats well in the microwave and fits their budget. Fill a 2-quart saucepan with water and heat over medium-high heat to a boil. Add the squash and cook for 5 minutes or until tender. Drain the squash well in a colander. Let cool for 5 minutes. Using a spoon, scrape out the seeds, leaving a hollow in the center. Heat the oil in an 8-inch skillet over medium heat. Add the onion and chile and cook for 2 minutes or until they are well browned, stirring occasionally. Add the tomato and beef to the skillet and cook and stir for 1 minute. Stir in the soup and water and cook for 5 minutes, stirring occasionally. Remove and discard the chile. Arrange 2 squash halves on each of 2 serving plates. Top with the beef mixture. Recipe Note: You can discard the squash seeds or stir them into the beef mixture, if you like.